The LT20 cuts logs up to 80cm in diameter and 4.8-8.4 m long. Log handling with the LT20 can be configured for the exact needs of your business – Manual or hydraulic log handling configurations are available to match productivity and budget requirements. The LT20 sawmill head retains the same productivity features of Wood-Mizer’s premium range. With the standard electronic SW Setworks, simply select the board thickness required and the head height automatically positions for each cut - no waiting for manual calculations. Forward and reverse movement is made by the adjustable power feed. 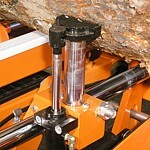 Professional Sawmills up to 7% off! Spring Sale!